William Script is a classic embroidery font perfect for many projects including Christmas stockings. It's a unisex font and works for both girls and boys of all ages. Featuring bold letters that really stand out on t-shirts and projects. Upper case letters A thru Z, lower case letters a thru z, numbers 0-9, punctuation as shown. 5 sizes included: .75, 1.00, 1.25, 1.50 and 2.00 inches. Size refers to the average height of the letters in the set. All letters are satin stitch and there are no split or filled stitches in any of the letters. William Script is a classic embroidery font perfect for many projects including Christmas stockings. It's a unisex font and works for both girls and boys of all ages. Featuring bold letters that really stand out on t-shirts and projects. 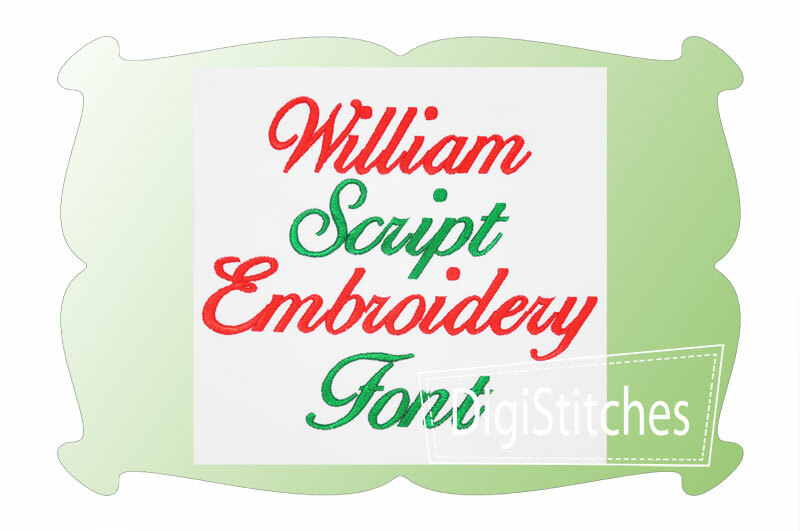 William Script Embroidery Font comes in 5 sizes: .75, 1.00, 1.25, 1.50 and 2.00 inches. Size refers to the average height of the letters in the set.